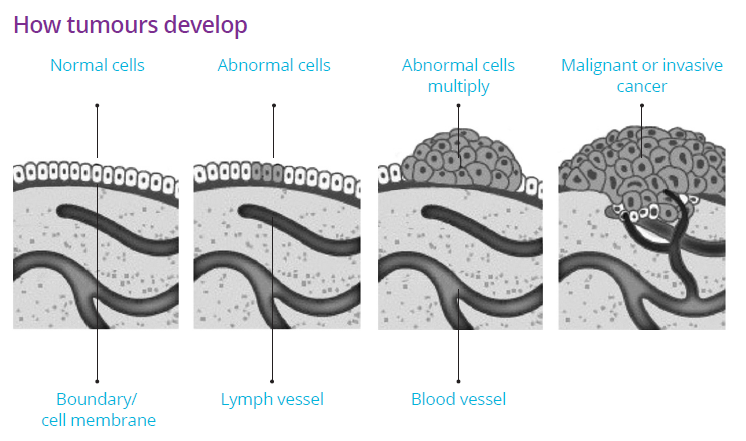 All cancers begin with changes in a cell or group of cells. The body is made up of many types of cell, which usually grow and divide in a controlled way to make more cells. These new cells are needed to keep the body healthy. When cells become old or damaged, they die and are replaced with new cells. The way a cell grows, divides and dies is controlled by its genes (DNA). Sometimes DNA gets damaged or changed. If this damage affects genes that tell a cell when to grow, divide or die, cells do not die when they should, and new cells form when the body does not need them. The extra cells which are made, change the composition of the blood, or forms a lump, called a tumour, which is the beginning of cancer. Malignant tumours are cancerous. Cells in these tumours can invade nearby tissues and spread to other parts of the body. Sometimes cells move away from the original (primary) cancer site and spread to other organs and bones where they can continue to grow and form another (secondary) tumour at a new site. This process is called metastasis. Secondary cancers keep the name of the original cancer location. For example, pancreatic cancer that has spread to the liver is still called pancreatic cancer.